In a month full of events there are two that are definitely worth a visit. One is the epic, interactive, incredible HavenHollow. If you go, bring a friend (or more than one). And if your computer can handle it, go through on ultra. I was able to, thanks to my recently acquired new video card, and it was really spectacular. Another is L’Amitie Fall Market, a small, intimate gathering of talented designers offering adorable items. This pic features the adorable Little Granny avatar from The Secret Store, which you can purchase at the HavenHollow Souvenir Shop. This avatar includes an adorable AO and a hud to change the colors of Granny’s glasses, sweater, skirt and slippers. There are also some free gifts at HavenHollow’s Souvenir Shop, including a cookie tray from The Secret Store that works with the Granny av. 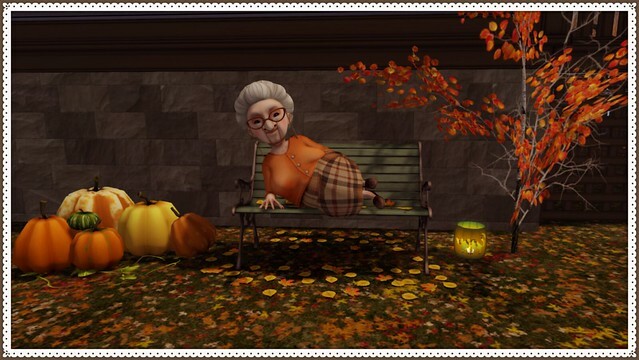 The bench Granny is rather saucily lounging on is from Consignment for L’Amitie. This bench features 8 metal and plank colors, as well as season change leaves, making it perfect for year round use! HavenHollow closes at 11:59 pm on Halloween. L’Amitie Fall Market runs through November 2nd. Don’t miss out! Check them out today.